I love camping as much as the next person, but know what to take camping can sometimes be a little tricky. Have you ever gone camping and forgot to pack something? While this may not be a big deal when staying in a hotel near the local 24-hour Wal-mart, it can be a big issue when you are roughing it in the woods. 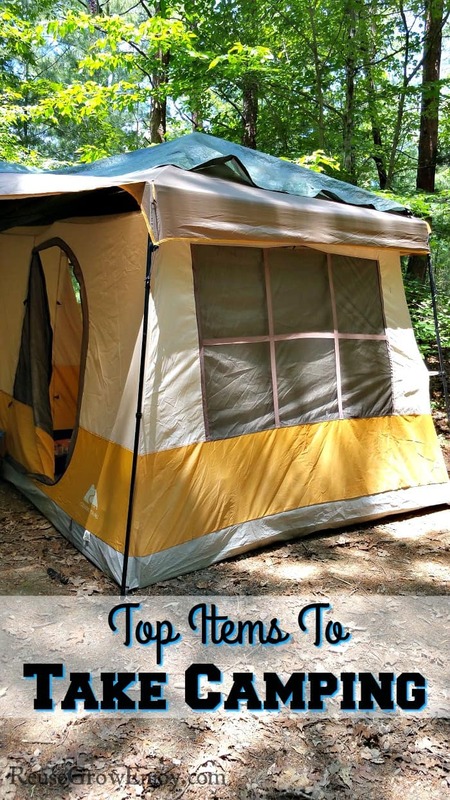 Here are my top items to take camping. A first aid kit or emergency kit is vital. You just never know what will happen. Be sure to pack a pain relieving burn cream or spray and quick clot to stop bleeding in large cuts. You never now what can happen and camping puts you a bit far out from help when you need it. While food will be on your mind, you don’t want to be caught without cooking pots and tools. Check these with your menu being sure to take everything you will need along with a big pot for boiling water to wash your dishes. If you are not sure what type of pots and pans to take, cast iron works really well for cooking over a fire or grill. Sunscreen and bug spray are a must for any camping trip. A strong insect repellent is vital ticks and mosquitoes are abundant in the woods and carry some nasty diseases they can spread to you with a simple bite. You may even want to make your own, check out my homemade bug spray here. Sunscreen protects you from the sun and from getting that nasty sunburn that will make your trip miserable. Be sure to bring spare clothes and blankets inside airtight bags. This is when those space saver bags come in handy. Nothing makes a camping trip worse than spending the entire weekend in soaked clothes because nothing stayed dry when a canoe flipped, or a downpour hit. Be sure to pack fully charged portable cell phone charger or even better a solar powered one. When you are relying on a device, it helps to be sure you will have power when you need it most. An old fashioned map and compass are handy to have on hand if you get lost out of range of GPS. Also if you run out of power on your GPS you will be more than happy to have this on hand. Be sure to remember your toiletries like your toothbrush, toilet paper in a waterproof container, and any medications you will need to take while on your camping trip. No, I did not forget essential camping gear. A tent, waterproof tarps for both under and over top of your tent and a sleeping bag are vital to keeping comfortable on your camping trip so you can enjoy yourself to the fullest. Also if you are looking for comfort when it comes to sleeping, a blow-up mattress works wonders. If you are in the market for one, the Fox Air Beds are AMAZING!! When planning your next camping trip take the time to give everything a double check before leaving the house, reduce how much you forget. For things like your toothbrush that you use between planning for your trip and leaving grab a spare that you can pack before you leave and not have to dig back out. While this is not everything that you may need for your camping trip, it should give you a good place to start.